This weekend will be the first ever SJIA Family day. More than 80 people are registered to be there – parents, pediatric rheumatologists from Cincinnati Childrens and anyone else interested in the disease. Children will be there as well and we have a room for them with Child Life helping out. Calling all Systemic JIA Families – join us at SJIA Family Day! Throughout the SJIA journey, we have met so many families who have kids with SJIA and have made deep connections with them. We have mostly met them online since there are no conferences or other events focused on SJIA where one can meet many SJIA families. We thought it was high time to organize a day devoted to SJIA, to bring together families, doctors and other medical experts focused on this disease. There’s an interesting article in Scientific American about a new trial for Rheumatoid Arthritis. The treatment involves a small pacemaker-like device that delivers tiny electrical shocks to the vagus nerve, a nerve that runs down the neck from the brainstem to several major organs, including the heart and gut. The US House of Representatives passed the American Health Care Act yesterday, May the 5th, 2017. If this bill becomes law, it will impact the health care of millions of Americans. It will be especially hard on children and adults with rare diseases, including children living with Systemic Juvenile Idiopathic Arthritis (SJIA). Eric Hoffman gave a great talk on how the community around Duchenes Muscular Dystrophy has driven research into treatments. This talk was very inspiring and touching, especially given the context of the first treatments for DMD recently being approved by the FDA. Eric is the founder and CEO of Reveragen, which is developing Vamorolone, a replacement for conventional steroids. It is targeted at DMD but is also a potential treatment for SJIA. The drug was recently fast-tracked by the FDA. Welcome to our new Patients Advisory Board! As we grow the foundation, we added a Patients Advisory Board so we could have better representation of the SJIA patients helping us make decisions about how best to serve our goals of finding a cure for SJIA. We have added three parents of kids with SJIA. We have been working with all three of them for some time, and know them well. They understand the purpose of the foundation and its philosophy and approach towards helping move SJIA treatment forwards. The three parents are: Leah Bush, Sabrina Dunlap and Kari Cupp. You can learn more about them here. Now that they are on board, you can expect us to pick up momentum in organizing more events and fundraising to support SJIA research. 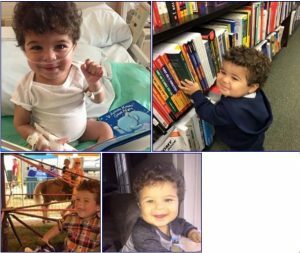 Our hearts go out to the family of Ethan Cox, a young boy in Cleveland who passed away from SJIA related complications over the holidays. His parents colleagues have organized a memorial fund in his honor, and have given generously. Please contribute if you can. Our mission is to find therapies so that tragedies like this don’t happen.